First Platoon, Co. A, 1st Bn., 14th Inf., killed eight would-be ambushers and seized their weapons without taking a casualty during a recent skirmish west of Pleiku. Captured equipment included five automatic rifles, hand grenades and a map overlay. The platoon was conducting a screening action when it ran into the North Vietnamese reinforced squad entrenched in eight bunkers. During the screening action, the platoon was entering a valley in a column-of-two's formation and guarded by right and left-flank security. A North Vietnamese Army (NVA) regular popped out of elephant grass to the platoon's front and the column's lead man downed him. Minutes later, as the right flank security was discovering a fresh trail, a member of the platoon spotted an NVA soldier preparing to shoot from a bunker. The soldier tackled two of his comrades - possibly saving their lives - and then returned fire. Platoon leader Mell R. Godbee of St. Louis called for a light anti-tank weapon man. PFC John A. Jackovac responded by firing a round to kill three of the regulars while knocking out the bunker. Meanwhile, PSgt. Daniel Martinez of Pecos, Tex.. called in artillery fire on the enemy's rear and flanks to prevent an escape. Within five minutes, Capt. Ora L. Boss, Company A commander, appeared overhead in a helicopter to direct artillery support and to watch for enemy movements. The captain buzzed the bunkers in a vain attempt to draw the enemy's fire and disclose his position. Without the enemy's exact positions for an artillery assault, the platoon attacked the bunkers from the front killing two NVA soldiers. Ten of the regulars escaped. The platoon set up defense positions in the abandoned bunkers when it was attacked in two rushes by what appeared to be the rest of the regulars. Three more NVA soldiers were killed before the enemy retreated. "We could have eliminated them in five minutes," said a tired Sgt. Martinez, "but we were wary of being sucked into a bigger ambush, and we took added precautions." The 25th Army, Republic of Vietnam (ARVN), Division Recon Co., has just completed a month-long joint training program with the 3rd Sgdn., 4th Cav., at Cu Chi. 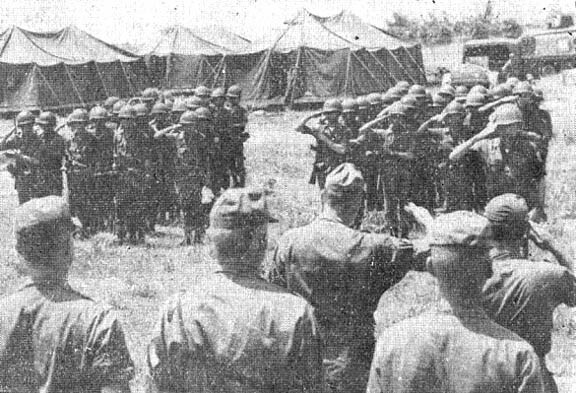 The ARVN unit, billeted for its month-long stay with Trp. B, 3/4 Cav., learned the latest warfare methods used in Vietnam. The instruction was given in the form of classes, conferences and practical exercises. The ARVN soldiers were trained in long-range reconnaissance, map reading, demolitions, first aid, night firing, escape and evasion, ambush tactics, basic reconnaissance and security tactics. They also received a short orientation on helicopter gunship tactics and "Eagle flight" training. The ARVN soldiers also participated in 3/4 Cav. field operations to put to practice the new tactics. The training program ended with a Hawaiian luau held at the Ilikai East Enlisted Men's Service Club. The Vietnamese were made honorary members of the 3/4 Cav. and the division by Lt. Col. John R. Hendry, squadron commander of the 3/4 Cav. Maj. Kelly G. Gregory of Hartsville, Tenn., has recently become division surgeon. He replaces Lt. Col. Robert D. Gamble of Quincy, Ill., who served the division since August of 1963. Maj. Gregory received his M.D. from the University of Tennessee School of Medicine in 1956. Entering the Army the same year, he served a one-year internship at Brooks Army Medical Center, Texas, and then was sent to Flight Surgeon School at Randolph Air Force Base, Texas. In 1955, he became flight surgeon at Fort Leavenworth, Kan., where he served for three years. Maj. Gregory attended the Harvard School of Public Health for his residency in Aero-Space Medicine, and continued his studies in Aero-Space Medicine at Brooks A.F. Base, Texas. From 1963 to 1964, Maj. Gregory served as chief of the Aviation Medicine Section at Fort Rucker, Ala., and then in mid-1964 joined the division in Hawaii, where he served as division flight surgeon. The division's 4th Bn., 23rd Inf., sponsored an all-out goodwill drive recently to win the support of a Vietnamese village during an operation near Cu Chi. The battalion's civil affairs section handled the first phase of the drive, spreading throughout the vicinity of Vo Dat, a village in the area of the operation, to distribute approximately 2000 pounds of clothing and medical supplies. 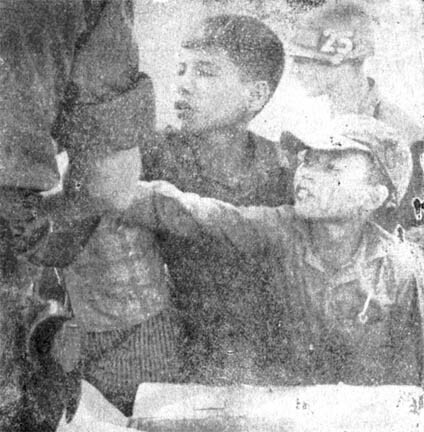 In the second phase, a four-man Vietnamese Psychological Operations team working with the battalion, distributed leaflets explaining what has been offered by both the communists and the government of Vietnam. The team members talked with hamlet chiefs and heads of many of the families, explaining why American troops are in the country, and answering questions about the war. About 7000 refugees have moved to the village during the past year to escape the severe taxation and conscription of the Viet Cong. In their new location, the refugees are not completely free of the Viet Cong, but are close to an Army, Republic of Vietnam, camp. Lt. Col. John M. Shultz, 2/14th Inf. Maj. Frank S. Farmer, HHC, 25th Inf. Div. Capt. Wendell J. Duncan, 25th MP Co.
Capt. William W. McFadden, 25th MP Co. Capt. Charles Miyashiro, HHC, 1st Bde. Capt. Edward E. Nelson, Co. C, 125th Sig. Bn. 1st Lt. William J. Specht, Co. C, 2/27th Inf. Maj. Robert T. Curry, HHD, 25th Avn. Bn. Maj. Nichol H. Doiron, D Trp., 3/4 Cav. Maj. Robert L. Graham, D Trp., 3/4 Cav. Maj. Peter W. Moore, D Trp., 3/4 Cav. Maj. Nat R. O'Day, D Trp., 3/4 Cav. Capt. Gary A. Brown, D Trp., 3/4 Cav. Capt. Jerry A. Collamore, D Trp., 3/4 Cav. Capt. Francis X. Delvy, D Trp., 3/4 Cav. Capt. Gary L. Hatfield, D Trp., 3/4 Cav. Capt. Joseph A. Lacy, D Trp., 3/4 Cav. 1st Lt. Lloyd B. Allred, D Trp., 3/4 Cav. 1st Lt. Lewis L. Barger Jr., D Trp., 3/4 Cav. Capt. William J. Hempstead, Co. D, 25th Med. Bn. WO Francis C. Dowd, HHB, 1/8th Arty. Sgt. Maj. Robert G. Miller, HH&S Btry., 1/8th Arty. SSgt. Howell B. Hicks, A Trp., 3/4 Cav. SSgt. John R. Mann, HHC, 4/9th Inf. Sp5 James Davis Jr., HHC, 1/27th Inf. Sp5 Edward L. Moore, HHC, 25th Inf. Div. Sp4 Duane C. McDowell, HHC, 4/9th Inf. Sp4 Ronald E. Proven, HHC, 1/27th Inf. PFC Francis L. Blair, HHC, 1/27th Inf. PFC John E. Cook, HHC, 1/27th Inf. PFC Danny McDaniel Jr., HHC, 1/27th Inf. Maj. Anthony J. Adessa, Co. B, 25th Avn. Bn. 1st Lt. Samuel J. Awtry, Co. A, 2/27th Inf. 1st Lt. George F. Smith, Co. A, 1/5th Inf. SSgt. Robert L. Lane, D Trp., 3/4 Cav. SSgt. Wilberto Sanchez, Co. B, 1/5th Inf. Sgt. David S. Collins, Co. B, 2/14th Inf. Sp5 Loren A. Nix, D Trp., 3/4 Cav. Sp4 William E. Lancaster, B Trp., 3/4 Cav. Sp4 Anibal Martinez-Lopez, Co. B, 2/14th Inf. Sp4 Curtis B. Milbrook, D Trp., 3/4 Cav. Sp4 George R. Reynolds Jr., B Trp., 3/4 Cav. Sp4 Dennis A. Weinstein, Co. B, 65th Engr. Bn. Much is said about the Viet Cong use of terror, which seems to be increasing. This is natural as the pace of the war steps up and support requirements grow faster than voluntary contributions. Taxes have been raised repeatedly in some areas. "Draftees" must fill in as voluntary recruiting proves inadequate. Terror-punishment seems to produce the fastest results, but it eventually reacts against those who use it unless they succeed in seizing complete power. Today, in many areas, the Viet Cong are faced with the administrative problems that afflict any government in time of war - and are losing voluntary support as a result. The Viet Cong have, from the beginning, made every effort to secure the support of members of the Republic of Vietnam Armed Forces (RVNAF) as well as the support of the civilians. Generally similar tactics have been used, emphasizing always the benefits to the individual and the high moral and patriotic worth of such a shift in allegiance. "Serve your country against the American imperialists," they say. "Don't be fooled because the Americans are more clever than the French; the Americans' motives are the same, but they use you as puppets." The general preference for the "soft sell" does not keep the Communists from killing, often by torture, whole garrisons of small posts they overwhelm when it seems appropriate to punish determined resistance or to frighten others in the area. Not infrequently one or two leaders will be brutally murdered as an example to the others. The dependents of the men may meet the same fate. Threats of reprisals against families are sometimes used as well. Within the last six years, the Viet Cong's Binh Van program - "proselyting," as they call it - has become a major program. A favored practice is the use of girls and women, speaking as sisters or mothers, to serenade small garrisons, calling to them to save their precious lives for their families' sake, and imploring them to have mercy on civilians. None of these programs has had noticeable success. Homesickness has been a major cause of desertion in the RVNAF, and this has plagued the Viet Cong as well. Prisoners, to the Viet Cong, are objects to be exploited, primarily for political and psychological purposes. Thus, prisoners are often held - and treated as well as could be expected by the standards of an Asian guerrilla army - for two or three months, re-education and then, if not notoriously anti-Communist or brutal, released. There have been instances in which American prisoners were held for some six months, exhibited in villages and hamlets, put under pressure to get them to sign documents that could be used for worldwide propaganda, and then released. 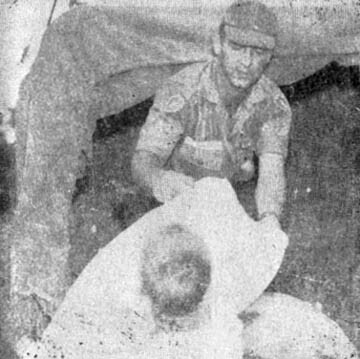 One American prisoner was reported executed in June 1965 in reprisal for the execution of a Viet Cong terrorist. Since January 1966, about 100 Vietnamese have been killed accidentally by Americans. What causes these accidents? Most of the time it is negligence or carelessness. Part of this can be credited to the Vietnamese, but too often most of the blame goes to the American driver. Pedicabs, xyclos and motor scooters don't watch where they are going; they cut in front of your vehicle suddenly without warning. All your life you have been around or near large vehicles; these people have not. You have more driving savvy than they do. Most important, you have the killing vehicles in your hands. It may be a small jeep weighing over 2000 pounds or one of the multi-ton trucks. Maneuvering through congested traffic and around corners without using good judgment causes 90 per cent of the accidents. The competition between military vehicles and most of the civilian traffic is completely unbalanced when you consider the size of military vehicles. Two of the biggest factors causing accidents are speeding jeeps and misuse of large trucks. If you are driving a jeep and have a fatal accident chances are that it is because of excess speed and running into one of the many small vehicles or pedestrians. If this same accident were to happen at a slower speed, the victim probably would be bruised and shaken, but alive. If you were going slower still, there may have never been an accident. If you are driving a 2 1/2-ton truck, most of your accidents will occur when you make right-hand turns or while changing lanes. Vietnamese law permits small vehicles to pass on the right. If you neglected to account for this, an accident is highly possible. As your truck turns the corner the inside circle gets smaller and the xyclo or bicycle driver is caught between your vehicle and the curb. The victim becomes one more statistic against us. CONCENTRATION - Don't daydream while driving. You have a lethal weapon in your hands. Keep your mind on what you're doing. Think ahead. The girls will be there when you're free from duty. CONTROL - Never let the situation get the best of you. Keep it under control at all times. If you go too fast, you aren't in control anymore. You're just a passenger in a bomb. COURTESY - You have a bigger truck and a bigger horn. Use them to bully your way through traffic and you've created a bad image for the United States here in Vietnam. You may also have blood on your fender. Give the other guy a break. Courtesy is contagious. 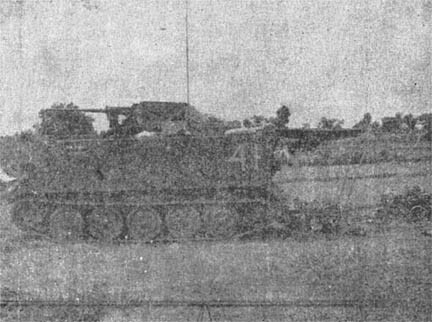 The armored personnel carriers (APC) of the 1st Bn. (Mech. ), 5th Inf., have been the backbone of many division operations. In combat these APCs get torn apart by rifles, grenades, mines and mortars. This is a story about the men who put them back together again. WO Arthur H. Alderson of Virginia, Minn., is the man in charge of the 1/5th motor pool where the APCs are kept in shape. With the 41 enlisted men working there, he is responsible for keeping the tracks ready to strike. A big part of this job is keeping the necessary spare parts on hand and ready for use. This task falls to Sp4 Donald H. Wessel of Portage, Mich.
"We go through about 1000 track shoes, 150 road wheel and 300 spark plugs a month, says Wessel, as an example of how many spare parts are needed. In addition to this, Wessel must keep track of some 1450 other parts used daily in the motor pool. Another man with a big job is Sp5 Amos Randolph of Tampa, Fla. Randolph is suspension specialist. His job is to keep the wheels and treads of the APCs in top shape. He can change a road wheel arm in 45 minutes, a job that would take anyone else at least an hour and a half. When Sp4 Alfred Hohmann joined the 5th Mech. motor pool he was asked if he could weld. He said, "I'll try, sir." Hohmann is now saving the Army $600 to $1000 a day repairing damaged engine blocks. The 5th Mech doesn't perform all its maintenance in the motor pool. Many repairs must be done on the spot in the field. Sp4 Bill L. Rodgers is one of the mechanics that handles this job. Rodgers is the driver of a light tracked recovery vehicle. This vehicle is a new addition, smaller than the other recovery vehicles but more maneuverable. The men in the motor pool at the 5th Mech. do not have a very glorious job, but it is a job that must be done. They neither win many medals nor make many headlines, but they are there every day, doing their job. Reconnaissance platoons earn their keep in any war and the recon platoon of the 1st Bn., 35th Inf., is no exception. Serving as the eyes and ears of their battalion, the platoon probes insecure areas and sets ambushes. During one recent patrol, the platoon encountered a North Vietnamese Army (NVA) battalion and took the brunt of its force until the rest of the 1/35th arrived. Although the platoon suffered moderate casualties, the NVA unit was eventually turned inside out and scattered. The platoon is often sent to scout terrain surrounding the battalion headquarters, about 20 miles southwest of Pleiku. As well as the usual problem of encountering NVA troops, members of the recon platoon contend with "jungle rot" of the feet during long patrols. Despite the hazards, 13 members of the original recon platoon, which arrived in January, still serve in the group. With six months of intensive specialized training in Hawaii and another six months of combat experience, the 13 help train replacements while attending to their regular duties. "New men learn fast here," said Lt. Patrick M. Ward, who took command of the platoon recently after six months duty as a tank platoon leader at Cu Chi. "Before long they fall in step with the more experienced members of the 1/35th's recon platoon." "For a minute there, I wasn't sure I was going to make it back home," said Sp4 John A. Lyons, a member of Co. C, 4th Bn., 23rd Inf., after an enemy mortar round had landed in his company area. Lyons of Ardmore, Pa., was crossing a road eight to ten yards from where the 60mm mortar round landed. "l was too scared to move when I first saw it, but then I ran like hell to the nearest bunker and waited for the explosion." The explosion never came. The mortar round was a dud, and 15 minutes later was taken away to be disarmed by an explosive ordnance disposal team. Three New Jersey resorts - Atlantic City, Wildwood and Palisade Park - all have elaborate boardwalks. More than two million feet (one million people) pace the boards each summer season. But these people promenade for the sheer pleasure of it. They stroll in the lazy afternoon sun. They marvel at the scenic view of the white caps of the in-rushing ocean. They shop and dine at the stores and restaurants which line the miles of wooden walkways by the sea. Boardwalks in Vietnam serve a different purpose. Take for example the boardwalks at Co. A, 25th Avn. Bn., at Cu Chi. Like the New Jersey resorts, there is plenty of water nearby. In fact, this is the main reason for the extensive platform network. The mud and lake-like puddles which accompany every rain made construction of a walkway necessary. Although some areas of the base camp have specially constructed walks most use shipping pallets to serve the purpose. These pallets are three feet by three feet and were originally built for shipping goods from the United States to Vietnam. At the Avn. Bn. an estimated 400 to 500 nine-square-foot sections were used. They run through such areas as sleeping quarters, mess hall and work areas. The six-inch height makes them ideal for keeping highly polished boots just that way. It also prevents possible disease by keeping a lot of feet dry. Children Gobble Up Gifts . . .
A young lady from Barnard, Kan., has found a way help the Vietnamese, American soldiers and American nurses through the "People to People" program and her local 4-H Club. Miss Kay Lynn Hartzell wrote to the "People to People" program in Kansas City, Mo. She indicated that she wanted to help several groups of people. First, she wanted to help Vietnamese village people. She also wanted to help American soldiers and nurses. Having no formal ties with the American effort in Vietnam, "People to People" referred her to the division. So Miss Hartzell sent the items, collected in grocery stores in Barnard and Lincoln, Kan., to Vietnam. When boxes of the collected items arrived, they were turned over to the civil affairs office for distribution. 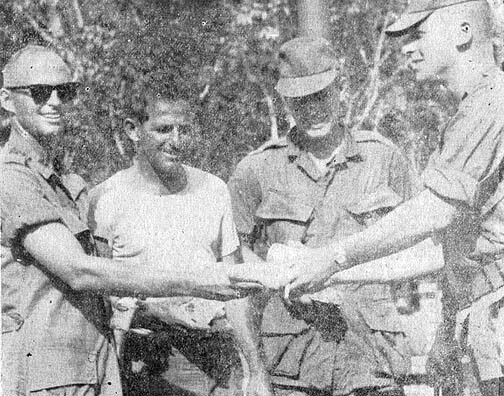 Fittingly, a lieutenant from Kansas, 2nd Lt. John Swensson of Wichita, a member of the civil affairs section, was selected to distribute the items to the Bac Ha I and II. Bac Ha I is a Catholic village and Bac Ha II is a "New Life" village made up of refugees. Children and adults greeted the donated gifts with wild enthusiasm. Food, soap and clothing were among the items distributed. Swensson said, "It is things like this, no matter how small they may seem, that will make the difference in this war." Other items, like popcorn and mix for iced tea, were given to soldiers of Co. B, 1st Bn., 27th Inf. Shampoo, face powder and other such feminine items were given to nurses of the 3rd Field Hospital in Saigon. The hospital treats wounded American servicemen. OVERRUN - 2nd Lt. John Swensson of Witchita, Kan., is almost overwhelmed by anxious youngsters of Bac Ha II as he distributes gifts collected by Miss Kay Lynn Hartzell of Barnard, Kan., of the "People-to-People" program in her 4-H Club. 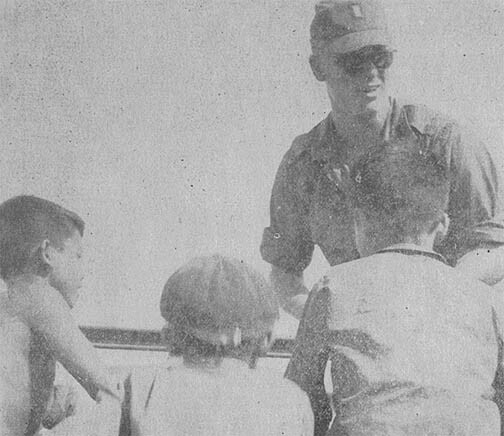 ITEMS - The outstretched hands of Bac Ha II children meet 2nd Lt. John Swensson. Several boxes of local groceries were handed out. 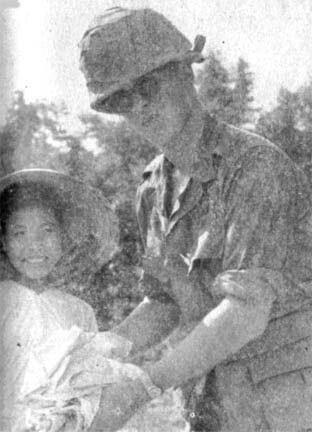 FOR YOU - 2nd Lt. John Swensson passes out clothing to a young lady at Bac Ha. Clothing was passed out to mothers. too. BOXES - Men of Co. B, 1st Bn., 27th Inf, look over boxes from "People-to-People" and the 4-H Club. YOU! YOU! 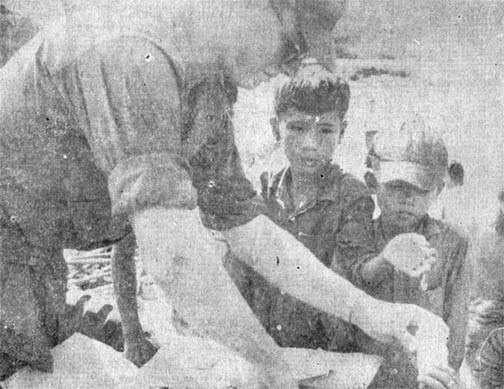 - The children of Bac Ha II reach for items distributed by 2nd Lt. John Swensson. The items came from the "People-to-People" program and the 4-H Club. Bac Ha II is a village just outside of Cu Chi. POPCORN - 2nd Lt. John Swensson (r.), civil affairs officer, passes out "People-to-People" supplies to the men of Co. B, 1st Bn., 27th Inf. Capt. Robert P. Garrett of Del Rio, Texas (1. ), company commander, receives some of the popcorn. The others were unidentified. When an infantryman wants to change the barrel on his M-60 machine gun, he can do it by himself in seconds. But when an artilleryman has to change the tube on his 175nnn self-propelled gun, he's got himself a job. The Army's first 175mm gun battalion, the 2nd Bn., 32nd Arty., has been providing heavy artillery support throughout the III Corps area since last November. Their eight big guns, complimented by four eight-inch howitzers, have taken a heavy toll of Viet Cong from the northern section of Tay Ninh Province to the swamps south of Saigon. Areas beyond the range of any other artillery weapon in Vietnam can now be effectively brought under fire. 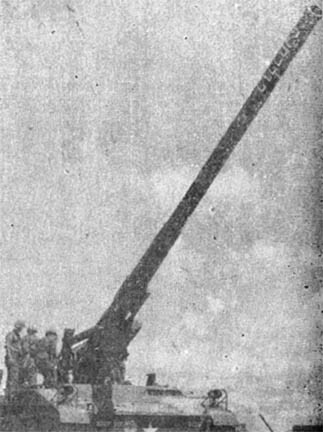 Having expended over 25,000 rounds of 175mm ammunition in support of allied forces, the "Proud Americans" have had a sizeable maintenance problem. Sizeable, in this case, is a tube 35-feet, 8-inches long, weighing more than six tons. Thus far, they have changed tubes 36 times. The enormous task is required because the internal pressure necessary to send big 147-pound projectiles 20 miles causes rapid tube wear. Merely getting the new tube to the gun locations is a job in itself. Upon arriving in Saigon, the tubes are convoyed to Cu Chi's 725th Maint. Bn., which provides direct support to the 2/32nd. The transport vehicles, operated by the 1st Logistical Command, carry two tubes apiece. If a 175mm tube has to be delivered quickly to an isolated area like Lai Khe, where the battalion's Bravo Battery is located, it will be transported on a C-130 cargo plane with six feet to spare. The actual changing operation requires the combined talents of a surgeon and a weightlifter. After the bulky two-ton breech ring assembly is unscrewed, the old tube is ready to be removed from its mount. Two truck wreckers take up the tube's weight and the self-propelled carriage is inched forward until the entire tube length has passed through the circular cradle. Installing the new tube is exactly the reverse. As the wreckers suspend the tube horizontally, the cradle is slowly moved back around the tube from muzzle end to breech end. According to 1st Lt. Richard Robbins of Beverly, Mass., the tube-changing operation takes about two hours. "We once changed three tubes in five hours," he adds, "and that's probably a record - if anybody keeps figures on it." "The hardest part," according to wrecker operator Sp4 Willie Sparks of Chattanooga, Tenn., "is keeping the tube balanced at all times. If you don't, it's possible that it might swing into the gun carriage. And six tons of metal could sure cause some damage." The 2/32nd packs some of the strongest muscle in the Army's lineup - and so must the men who change the tubes. What won't someone do to get a Viet Cong? The 1st Bn. (Mech. 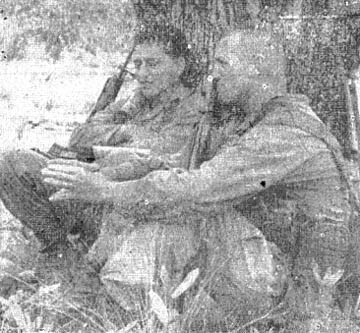 ), 5th Inf., has yet to find the answer to the question as they illustrated during a recent division operation near Cu Chi. Operating near the Oriental River, a Mech. reconnaissance platoon used every means of transportation to run down the elusive enemy. When the command-and-control helicopter spotted some Viet Cong, the armored personnel carriers (APC) took chase. When the APCs were stopped by the waist-deep water and mud, the men waded. When the mud gave way to small ponds and canals, the "Bobcats" started swimming after the Viet Cong. If swimming became impractical because the VC had too much of a head start down a canal, the recon team commandeered a sampan and poled its way down the stream. Said one soldier, "l've taken the point before, but this was the first time I did it from the bow of a sampan." Faster than a speeding bullet, more effective than the fastest jeep. That's the "Woflhound Express," of course. The Wolfhound Express is the name the 2nd Bn., 27th Inf., "Wolfhounds" have given to their S-4 supply section. The supply section prides itself in its own motto: "The Wolfhound Express, anything on a minute's notice." Capt. Dale D. Bergsten of Claycenter, Kan., is the battalion S-4 officer and the head of the "Express." He and his men boast that they get "anything" to the troops in the field in the time it takes the chopper to make the trip plus two minutes. The speed of the "Express" is accomplished by an unusual vehicle called "Buck Rogers." "Buck Rogers" is a van parked at the division airstrip while the battalion or any part of it is in the field. The van has everything the troops might need. "Buck Rogers" got its name from Capt. Bergsten. When he was given the task of providing a faster way of getting the supplies to the troops in the field, he said, "We'll have to dig out our old Buck Rogers' comic books and come up with something." Some of the vehicle's articles are unusual in themselves. 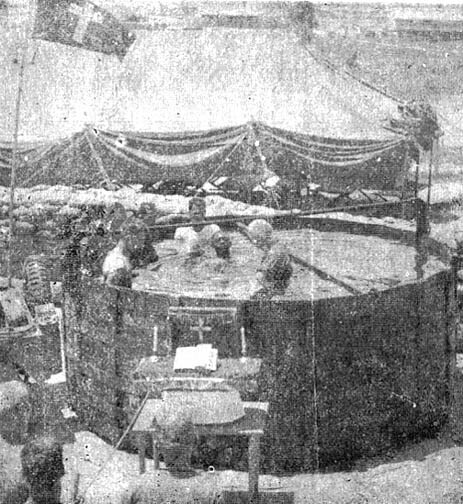 Among them is an underwater viewing device made from a 155mm artillery canister. The troops in the field use the device for finding Viet Cong arms caches and on occasion a wet VC. The "Wolfhound Express," with the help of "Buck Rogers," can send out a hot meal, more ammunition, fresh water, a pick and shovel or a spare hand set for a radio all in a matter of minutes from the time it is requested. The Wolfhounds especially like their new "Express" because it lessens the load they must carry on their backs. Gen. Ernesto S. Mata, chief of staff of the Philippine Armed Forces, accompanied by members of his staff, visited the division base camp as part of a familiarization tour of military installations in Vietnam. After a briefing on current division activities, the visitors toured the base camp, stopping at 25th Med. Bn., Support Command, Helping Hand Operations Center and the 2nd Bn., 27th lnf. Accompanying the group was Maj. Gen. James R. Winn, chief, Joint United States Military Aid Group. Nearly 1200 Vietnamese civilians from surrounding areas are employed by the division as laborers, enabling military personnel to carry out Cu Chi's more important tasks. First Lt. James A. Breedlove of Athens, Ga., the civilian employment officer, explained that the Vietnamese civilians work eight hours a day, six days a week. Of the 1200 employed, almost two-thirds are women. A minimum working age of 16 has been set; there is no maximum age. Lt. Breedlove said that for security reasons all workers are counted and checked as they enter and leave the base camp. Payment is made at the end of each working day to most of the workers. Women earn 70 piastres daily; men receive 80 piastres; and supervising personnel are paid 90 piastres. Skilled workers such as carpenters and masons are paid up to 160 piastres daily, and may be seen carrying the ancient tools of their trade to work with them each day. "The Vietnamese are fine workers," says Sp4 Eric Mooney of Monterey, Calif., an interpreter with Support Command Civil Affairs (S-5) section. "Perhaps the only difficulty that arises is the language barrier." But Mooney, who learned to speak Vietnamese fluently at the division's language school in Hawaii, has alleviated the situation. Accompanying Mr. Tran Van Rang, the, chief supervisor of the workers, he reviews the workload, checks the workers at the camp daily, correcting any mistakes and clearing up any misunderstandings. Civil affairs personnel note that the Vietnamese take great pride in their work and are scrupulously honest. "If a worker is overpaid," Lt. Breedlove commented, "he will give the money back or stand at the gate until the person making the payment realizes his mistake." In case of illness or accident, the workers are treated at division dispensaries. Serious cases are taken to the base camp hospital for treatment. Vietnamese, Korean and Filipino civilians also perform skilled jobs. For example, one battalion employs many civilian bookkeepers, clerk-typists and barbers. They are also secretaries, water-foremen and generator operators. Skilled civilians work under the management of Charles B. Kochenach, the civilian installation manager. The laundries at Cu Chi are operated entirely by Vietnamese, with each laundry employing about 20 trained people. Lt. Breedlove stated that an estimated 250 skilled civilians will be employed by units of the 25th in the future. The civilian employment program has accomplished two tasks: first, it has eliminated minor, time-consuming work for its military personnel; and secondly, it has provided work for many of the formerly unemployed citizens of Ha Nghia Province. The Capitol - Symbol of Freedom, the 120-page book of which more than 170,000 copies were sold when it was first published, has been revised including updated photographs. Providing a story of American traditions, the book contains a pictorial story of the Capitol in general and the House of Representatives in particular. The book may be purchased for 50 cents from the Superintendent of Documents, Government Printing Office, Washington, D.C. 20402. Just Cold Ham, Dirt, Sweat, Insects, Etc. A day in the life of a member of a mechanized infantry unit may be 24 hours in physical time, but in strain and emotion it can sometimes stretch into weeks. At 6 a.m., the men of Co. B, 1st Bn. (Mech. ), 5th Inf., roll off grass mats they have spread between themselves and the mud and crawl from beneath their ponchos that have kept off some, but not all, of the night's rain. It could have been any other unit, but this time it was Co. B. A steel helmet half full of water is their shower and wash basin. They shave but the razor pulls the whiskers out more than cuts them off. They brush their teeth and wash off the dirt and sweat as best they can. Some comb their hair. It is time for breakfast. A can of cold ham and lima beans or beef, spiced with juices or chicken boned is washed down with a can of warm water that tastes of chlorine and the plastic bottle it has been in for the last 16 hours. The improvised shelters are torn down and the ponchos and mats are folded and lashed to the top of the armored personnel carrier (APC). Ten men crawl into a space the size of a Pullman roomette with a four-and-a-half-foot-high ceiling where they will ride for the better part of the next 12 hours. It is 6:30 a.m. when the Company moves out of its bivouac area and heads for the woods. The sun is just coming up but already the men inside the APC begin to sweat. It is a bumpy, jarring ride over rice paddies and through hedgerows and the soldiers are thrown up and down, forward and backward, left and right. They bounce against the seats and the sides and each other. The grenades and ammunition and tools and C-rations that had been neatly stowed begin to fall from shelves and clutter the floor of the track. The company reaches the woods in 15 minutes but a half-hour halt is called while artillery from Cu Chi fires at targets spotted by an aerial observer. The time passes and soon the word comes to move into the woods. With a race of the engine the APC lurches forward and within seconds the crash and splinter of bamboo and brush is all around. Then starts the rain of leaves and twigs and insects of all kinds that will pour through the open hatch for the rest of the day whenever the track is moving. Ten minutes into the woods there is a clearing. As the APCs of Co. B approach, two shots ring out and two Viet Cong snipers race across the open space for the woods on the other side. Six tracks charge forward on line with 50 caliber machine guns blazing. There is an electric thrill in the charge of an APC with its engine roaring and machine gun firing. The men inside are keyed and ready for a fight. applies himself to ferreting out the VC in their underground haunt. The tunnel gets smaller after about 50 meters, and the tunnel rat can go no further. He comes out covered with mud and in his place goes a charge of plastic explosives. The blast seals this end of the tunnel but there may be half a dozen other ways in and out. The company pushed on to a part of the woods that appears to be a city with houses and shelters and bunkers every 10 to 20 yards. Some of the fortifications are covered with concrete, others with logs and two feet of dirt. There are many low-roofed lean-tos with bomb shelters beneath them. Tunnels and trenches run everywhere. The tracks knock down some of the shelters. Others are burned. To the right there is rifle fire, and it is answered with machine guns. Another sniper but he is quick and cannot be found. The tracks push on through the woods. About 12: 30 p. m., another halt is called, and a book and a newspaper and a pinochle deck appear, and someone passes out C-rations. After a short lunch that is more shoveled than eaten, some of the troops lay on top of the APC and try to catch up on some of the sleep they missed the night before. In an hour they are on the move again. It is 2 p.m., and the day is at its hottest. Another encampment is found, and with it comes the order to dismount and search. The enemy, however, will not be found today. he has left his food and some of his ammunition and tools behind and fled. A wind comes up and men scramble for ponchos because they know it means rain. Some are so soaked in their own sweat that they do not bother to cover themselves. The rain is cool and refreshing and someone wishes he had a cold beer but settles for warm water. The rain turns the ground to mud and some of the tracks get stuck crossing trench lines and gullies. The tracks stop and then start again and one of the drivers complains he could make better time crossing the George Washington Bridge at rush hour. The day wears on, and there is more searching and destroying until it is time to turn around and go back to the bivouac area. On the way back the APCs keep to the same trails they had cut earlier in the day to avoid hitting mines that might lay where they hadn't been. But the Viet Cong have moved behind Co. B and planted more mines in their path. Halfway through a small clearing the lead track hits one. It lifts up the track and bends a road wheel but no one is hurt. The column halts and waits for a damage estimate, and everyone waits by their guns for an ambush. The track is not badly damaged, and the column moves on but it is getting dark, and it starts to rain again. In a half hour, Co. B is home again or at least what will be home for the night. Now they will clean and refuel their tracks and pitch their improvised shelters. If they are lucky, they read a letter from home. There will be the usual day's end bull session and the last cigaret and then they will go to sleep listening to mortars and artillery harass the enemy that they could not find. It has been a disappointing day for the men of Co. B, 1st Bn. (Mech. ), 5th Inf. They were spoiling for a fight and they could not find one. But tomorrow is another day, and perhaps it will not be the same. Life begins to stir as members of a mechanized unit shake loose from the previous night. On the road, mechanized units move along in search of the elusive Viet Cong. 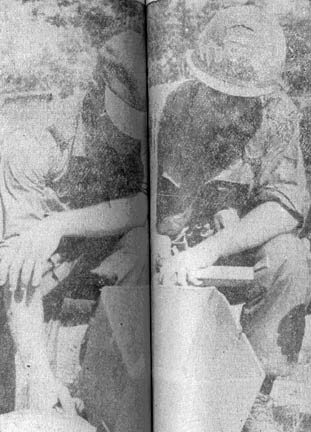 The division's Cu Chi base camp was under mortar attack. Deep within the safety of the 2nd Brigade Tactical Operations Center (TOC) bunker, Capt. James F. Kenyon of Cleveland and Sp4 Daniel L. Sacco of Chicago were busy at work. It was Tuesday evening and Capt. Kenyon and Sacco, of the brigade intelligence section, had just completed the daily intelligence summary. "We heard three or four explosions," Capt. Kenyon said. "All at once there was a loud noise... not a bang, sort of a dull thud. We glanced up just as a big shiny metal object slammed into a 12-by-16-inch beans and dropped a few inches from where I was sitting." The "shiny metal object" was a Viet Cong shell. With no further urging, they quickly abandoned that section of the TOC. Capt. Kenyon looked around the corner. He had been correct. The unexploded shell remained on the floor. In the operations portion of the TOC, Maj. Thomas Ulvenes of Faribault, Minn., was on the phone alerting the aviation section. Hearing the major on the phone, Capt. Kenyon, also an aerial observer for the brigade, grabbed a radio and bolted for the helicopter pad. Four minutes after the first explosion, the brigade's helicopters were airborne. Later, after estimating that some of the rounds were coming from Xom Moi one mile northwest of the camp, Capt. Kenyon spotted VC mortar flashes. The S2 captain called in accurate artillery fire which suppressed that mortar. "As I got to thinking about it," said Capt. Kenyon, "I was pretty shaken. Here we were in the TOC, thinking it was the best protection possible and this big round comes right inside." It was a 75mm recoilless rifle round. The shell, fired on a low trajectory, had crashed through a latrine 75 yards away and ricocheted off the ground. It had entered the TOC through a ventilation port just below the sand-bagged, steel planking on the roof, struck a cross beam and came down through the plywood ceiling. Volleyball may be an easy game for the American G.I. who has played the game since grammar school, but for the children of Vinh Cu, a village just outside Cu Chi, it proved to be a bit difficult. A team of adept volleyball players from the 65th Engr Bn. took their net, ball and uprights to the village recently during a civic action program there. At first, the youngsters were disorganized. Keeping them in their positions was difficult. 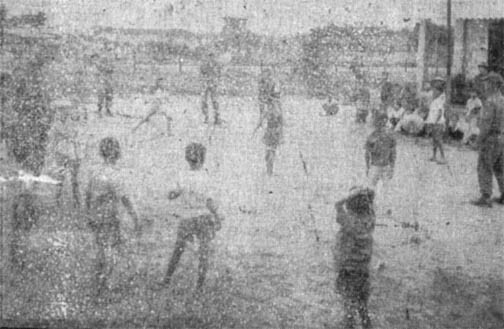 When the ball was introduced, the children used their hands to shield themselves from what they thought would be bruising blows. Slowly, however, enthusiasm began to build, and the kids started running all over the court with little regard to the "sides." Eventually, after a lot more organization and a little more practice, the number of volleys between points increased, but the server was still working harder than anyone else. "It'll take awhile," said one engineer, "but what the kids lack in skill, they make up with spirit." "Volleyball at Vinh Cu," he said, "is going to be a number one sport." Even in the Army reunions are rare when they take place 12,000 miles away and 14 years later. In 1952, PFCs James Kirkpatrick, George Murray and Joseph Parlas were on the same field training committee at Fort Knox, Ky., for seven months. Murray then went to Armor Officer Candidate School (OCS) at Fort Knox, Kirkpatrick and Parlas went to Infantry OCS at Fort Benning, Ga. It was not until this June that the three men met again. The scene was the forward command post of the 3rd Brigade near Pleiku. Majors today, they talked about their families and the assignments they have had. Maj. Kirkpatrick is the brigade logistics officer, Maj. Murray commands the 170th Airmobile Co., and Maj. Parlas commands the 155th Airmobile Co.
PFC James J. Adney of Arpin, Wis., was on a tunnel clearing operation with Co. A, 2nd Bn., 14th Inf., about three miles east of Cu Chi. He and other machine gunners formed a ring of protection around his company while it blew up the many Viet Cong tunnels and spider holes in the area. PFC Adney had been in position about two hours when something strange happened. He turned to Sp4 Ronald J McCullough of Phoenix and said, "I feel something funny." "What's the matter? You sick?" asked McCullough. "No," said Adney. "Listen, here, knocking under the ground." "Yeah, like wood on wood," said McCullough. "Must be a VC under here," they agreed. The knocking continued as the two prepared a 40-pound shape charge of explosives. They placed the charge above the knocking and ignited it. A Department of Defense draft study shows the rate of inductions since September 1950 has been about 18,600. Draft calls were issued every month except May and June 1961. Some 11.3 million men entered or were called to active service as enlisted men. Of this number, 3.5 million - nearly one in three - were draftees. A weekly summary of major Army actions in the Republic of Vietnam compiled by Army News Features from Department of Defense published Official MACV Communiqués. ARMY FORCES reported no significant contact with the enemy as ground operations continued. U.S. strike pilots flew 2636 sorties against enemy targets in the Republic. The pilots were credited with killing some 498 enemy and damaging or destroying more than 1697 enemy structures and fortifications, along with numerous sampans. The air strikes also started many secondary explosions. 1st CAVALRY DIVISION (AIRMOBILE) - No major actions reported for the period. 1st INFANTRY D1VISION - No major actions reported for the Period. 1st BRIGADE, 101st AIRBORNE DIVISION - Operation FILLMORE, a multi-battalion operation, which began on March 25 about 50 miles southeast of Qui Nhon in the Tuy Hoa area, terminated on July 21. A multi-battalion force of the Korean Marine Brigade and elements of the Screaming Eagles' 1st Brigade accounted for 375 enemy killed, 73 captured, 473 suspects detained and 59 individual weapons and one crew-served weapon seized. A total of 679 air sorties were flown in support of the four-month operation. Friendly casualties were light. 173rd AIRBORNE BRIGADE (Separate) - No major actions reported for the period. The division engineers have built their own castle. Named after the branch insignia for the Corps of Engineers, the "Castle Club" is the new enlisted men's club for the 65th Engr. Bn. One of the plushest clubs at Cu Chi, the "Castle" is owned entirely by the battalion's enlisted men. It was built in 10 days by a Vietnamese construction firm at a cost of nearly $3000. The money for construction and the comfortably appointed interior came from the men. Tables, cushioned chairs, a Polynesian style bar and a bandstand are outstanding features inside the new club. Lt. Col. Carroll D. Strider, battalion commander, of Flat Rock, N.C., cut the ribbon to officially open the "Castle Club." Inside to greet the men were SMaj. Earl Ready of Austin, Texas, and club manager Sgt. Howard Flora of Farmville, N.C.